With all the attention on the intelligence-sponsored unrest and military operations in Asia, the Middle East, and North Africa, the money cartel's aggressive economic contractions being wrought domestically and around the globe, and the unusual number of bulls-eye natural disasters on the Pacific Rim, it's easy to overlook the civil wars and genocide being waged in the heart of Africa. Yet, the mother continent has long borne the brunt of European colonialism, with slavery and expropriation of indigenous lands, including the ruthless and bloodthirsty extractions of gold, oil, diamonds, and other precious metals and minerals. 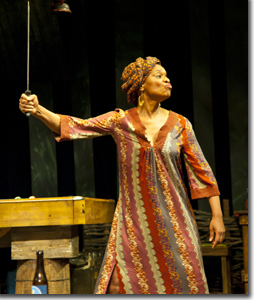 In a brilliant, unpredictable, and poignant masterstroke, Lynn Nottage's Ruined—winner of the 2009 Pulitzer Prize for drama—captures the human toll of these aggressions. Mama Nadi (Kim Staunton) is the proprietess of a bordello and gathering spot deep in the jungle of the Democratic Republic of the Congo. She has managed to survive by running a tight-fisted operation that caters to all warring parties, as long as they unload their guns at the door. The call girls, too, must kow-tow to Mama, who reminds them of the abuse from which she rescued them, while taking full economic advantage of their powerlessness. On occasion, even Mama is forced to do obeisance—to the commander of the government troops (Keith Hamilton Cobb), to the rebel chief (William Oliver Watkins), and to their solidiers (Maurice Jones and Biko Eisen-Martin)—but for the most part, she rules the roost. The only customer that gives her any gruff is Christian (Harvy Blanks), who for years has been supplying her with provisions, not to mention a steady stream of romantic proposals, which Mama dismisses with nary a second thought. Of Stauton's many memorable performances at the Denver Center, this one tops the list. At first, her catharsis seems so unexpected; yet, in retrospect, the signs were there all along—in the subtext of those moments when Mama, alone with her thoughts, reveals her disposition in body language and comportment. Whenever Mama and Christian have at it, Blanks wonderful comedic touch goes a long ways, sustained by what comes across as irrepressible optimism. 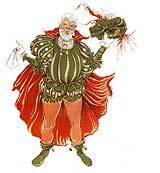 He may seem like an unlikely leading man, but he carries it off with aplomb. 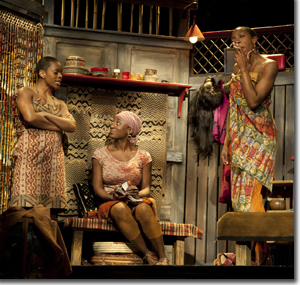 The separate tragedies of the three young women who work the place would be overbearing if not for Nottage's capacity for unusual redemptive twists: the lithe Josephine (Joy Jones), who yearns for a glamorous life away from the strife with the trader Harari (Sam Gregory); the dishonored Salima (Daphne Gaines) desires a reconciliation with her husband, Fortune (Sheldon Woodley), who abandoned her after she was kidnapped and raped by soldiers; and the mangled Sophie (Tallia Brinson), impaled by soldiers, who dreams of an operation to repair her loins. It is here that Nottage grabs us and refuses to let us off the hook, for what are they fighting over?—in earlier colonial times it was ivory and rubber; now it's diamonds (30% of the world's supply), cobalt (80% of the world's supply), coltan (used in electronic components and cell phones, 70% of the world's supply); some of the purest copper ore on the planet, and many other minerals. And who places value on all this material? As the celebrated comic strip character Pogo used to say, "We have met the enemy and he is us." 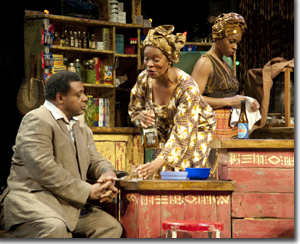 Everything about Nottage's script and director Seret Scott's production rings true: Michael Ganio's ramshackle juke joint; the Afro-pop rhythms of Ron McBee (congas) and Keith E. Johnson (guitar); the ever-present threat of violence; and the strong hearts that have survived despite the apocalypse the Western powers are perpetrating on these folks. The Denver Center Theatre Company's production of Ruined runs through April 30th. 303-893-4100 or www.denvercenter.org.